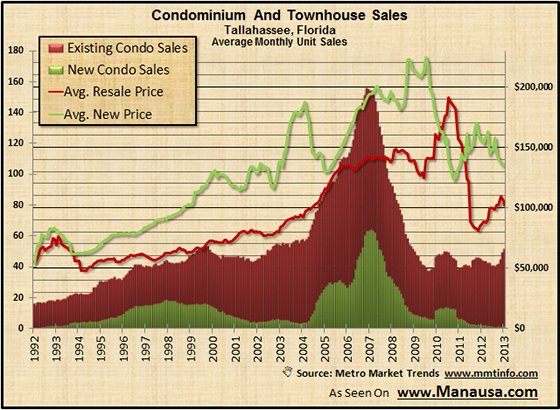 Has The Tallahassee Condominium And Townhouse Market Fully Recovered? Anybody who is curious about the Tallahassee condominium and townhouse market might be surprised to find that the sale of new construction of these units has almost reached zero. There have been only 22 recorded sales in Leon County in the past twelve months, or just under 2 per month of newly built condominiums and townhouses. That surely does not bode well for people sitting on developments of these attached housing units. The real estate graph above shows just how far new construction for these attached units has declined. The vertical brown bars measure the one-year trend of monthly new construction condominium and townhouse sales, while the blue line records the average sales price of these units. We can observe a large run-up in the average price of these units from 2005 though 2009 as the downtown Tallahassee condo market was created, and the subsequent decline and “return to normal” when those sales went stone cold. The average price for a new townhouse or condominium has hovered around $150,000 since 2010, and we can expect a lot of “noise” in our average price point if unit sales continue to be so low. When we look at the entire Tallahassee condos sale market and segregate new construction sales from existing home sales, something interesting pops right up. Other than the spike during the boom of the housing market, we could argue that the current rate of sales for the Tallahassee condominium and townhouse market is exactly where it should be, based upon our 22 years of home sales information. The image below shows a “stacked graph,” where the green area measures new construction sales of condominiums and townhomes, while the red area records the number of existing (resale) condo and townhouse sales. Note that our current rate of 52 sales per month in the Tallahassee condominium and townhouse market is as high as any time period recorded (outside of the window between 2004 and 2008). Does this mean that things are back to normal for the attached market? I believe that rising land costs have pushed builders and developers (in recent years) towards attached housing, thus we should be seeing a steady rise in sales for the Tallahassee condominium and townhouse market. Were it not for the current real estate market cycle (recovery), I believe condominium and townhouse sales would be sharply higher. Thus the graph above is likely to see a continued rise in sales as buyers return to the market. If you need to sell a home in the Tallahassee condominium and townhouse market, simply drop me a note and we can schedule a time to review your options and best course of action to achieve your goals.